Leaping, turning and pronking through the high desert, it’s hard to believe that two years ago this champion bird dog was diagnosed with osteosarcoma. Statistically speaking, Boone shouldn’t even be here – especially because he didn’t have chemotherapy. His longevity has stunned everyone around him, but his humans aren’t really surprised. 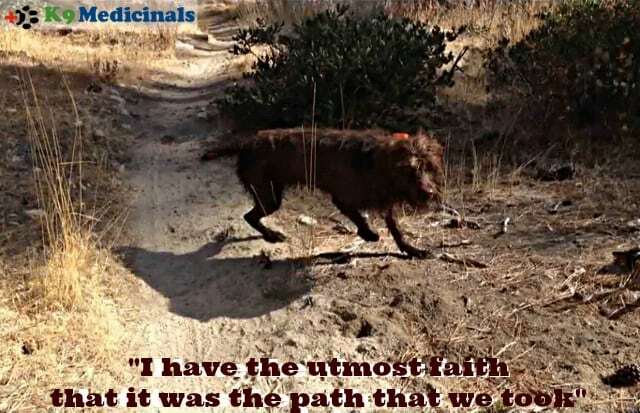 In their hearts, they know that Boone is thriving because of his daily immune system support from medicinal mushrooms found in K9 Immunity Plus. We love sharing information about proven holistic veterinary supplements, which is why we are sharing Boone’s story with you. 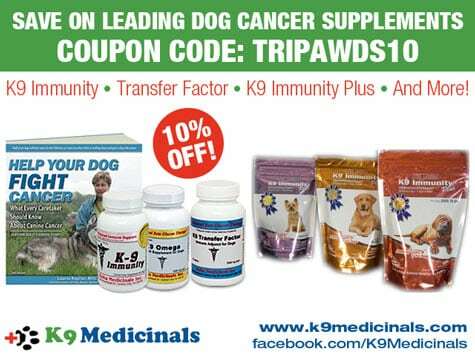 We are being compensated for creating awareness around K9 Medicinals supplements but we only share information we feel is relevant to the Tripawds Community. K9 Medicinals is not responsible for the content of this article. Four year old dogs aren’t supposed to get cancer, but the osteosarcoma cells invading Boone’s leg never got the news. In October 2013 when Cindy and Daniel Thompson got the bad news that Boone had osteosarcoma, vets were as stunned as they were. “We were pretty scared,” remembers Cindy. One week prior, Boone was just hitting his stride flushing birds in the Sierra Nevada mountains. Agile and quicker than other hunters, “He leaps and bounds just like a deer,” says Cindy. 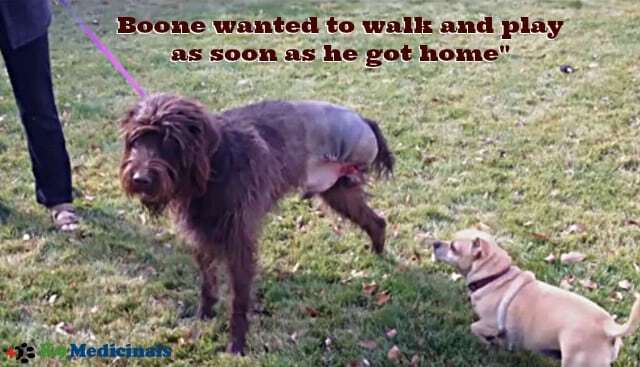 Boone had everything going for him, which is what made his osteosarcoma diagnosis even more devastating. Daniel was so distraught from the news that he took time off from work to research different osteosarcoma treatment options. “The first thing you do in today’s world is you get up on the internet and look up ‘osteosarcoma.’” says Daniel. One search led to another with more odds stacking up against Boone. But then he stumbled upon DogCancer.net which features studies about immune system support from medicinal mushrooms and how they can help dogs with cancer. Daniel had just found K9 Immunity Plus. These powerful mushrooms include the ones you’re familiar with, like shitake, but also less common ones like coriolus, agaricus and cordyceps. 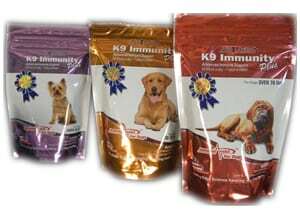 All are carefully combined into K9 Immunity Plus™, a one-step chewable treat that boosts dogs’ immune systems. Two years later, the dog sitting by Cindy and Daniel’s feet is all the proof they need to know that K9 Immunity Plus was the best decision for Boone. “Here we are. Two years later and he’s got a vibrant, full life, he’s an awesome hunter. He still retrieves, points. We attribute it to the immediate care that we did, we didn’t linger. The best route was to get rid of the limb, get rid of the cancer as fast as we can.” says Daniel. 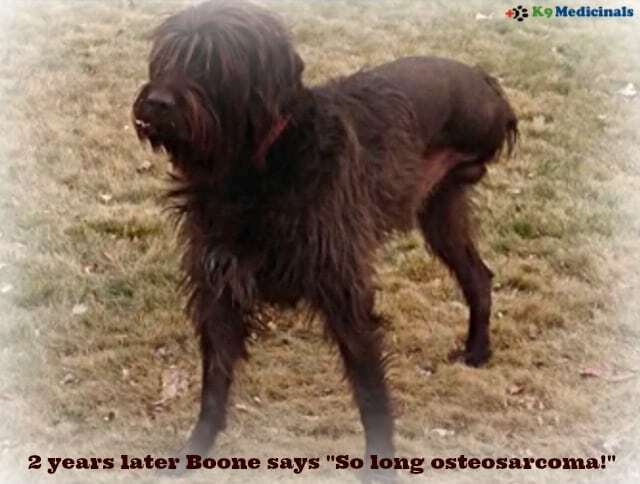 With each passing month Boone skewed the depressing osteosarcoma survival statistics. Last October when he reached his two year ampuversary, his fan club was elated. Daniel and Cindy’s treatment choice worked better than anyone imagined. Watch this in-depth interview about Boone’s journey. (Photos by Daniel and Cindy Thompson). NOTE: This information is not intended to replace professional veterinary advice. All cancer treatment therapies should first be approved by your veterinarian. Please share this medicinal mushrooms information with your vet and encourage them to contact K9 Medicinals with any questions they have. VICTORIOUS BOONE!! We LOOOOOOOVE success stories around here!! The pictures and the video…great testament to a dog living life to the fullest! Thanks.so.much for.sharing Boone with us! He truly is an inspiration to anyone starting this journey!